Dersingham Village01485 532610work VillageOne of the largest villages in West Norfolk, Dersingham is 9 miles north of King's Lynn. The village has many local amenities and is served by a Post Office, two supermarkets, florists, a garden centre, garages, a true cobblers, chemist, dentist, opticians, chiropractors, hair and beauty salons, butchers, newsagents, takeaway outlets and soft furnishings outlets. Dersingham is served by two public houses, The Feathers and The Coach & Horses. Dersingham's St Nicholas Church was built on the site of a Norman Church. It is one of the great churches of the 14th century. Of particular architectural note are the ancient 14th century walls, windows, stained glass, Gothic pointed arches and tower with six bells. During the summer months St Nicholas is open from 12noon to 4pm for visitors. Next to the church, Dersingham's magnificent Tithe Barn was erected in 1671, although it was never used to collect tithes. It is built of clunch and carrstone and features a brick dressing. For hundreds of years the barn was an essential part of farm life in Dersingham. The Barn and its surroundings are a tangible link to the past. 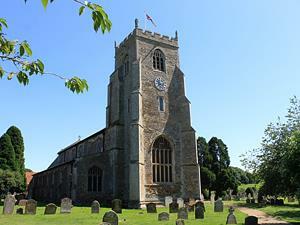 One of the largest villages in West Norfolk, Dersingham is 9 miles north of King's Lynn. The village has many local amenities and is served by a Post Office, two supermarkets, florists, a garden centre, garages, a true cobblers, chemist, dentist, opticians, chiropractors, hair and beauty salons, butchers, newsagents, takeaway outlets and soft furnishings outlets. Dersingham is served by two public houses, The Feathers and The Coach & Horses. As well as being close to Sandringham, Dersingham is well located for visiting the coast.